Daucus carota – the carrot – was cultivated from wild carrots in the countries we now know as Afghanistan & Iran and are mentioned there in the 10th century and by the 12th century they were mentioned in Europe. These tap roots were originally white, yellow or purple in colour. The orange colour that we recognise today was breed by growers in Europe in the 17th century especially in the Netherlands. It is thought that this was in honour of Prince William of Orange-Nassau (Willem van Oranje) who had an orange stripe on his flag. Nowadays orange is thought of as the national colour for the Netherlands. These pancakes made with carrots in Polish are called racuszki z marchwi. 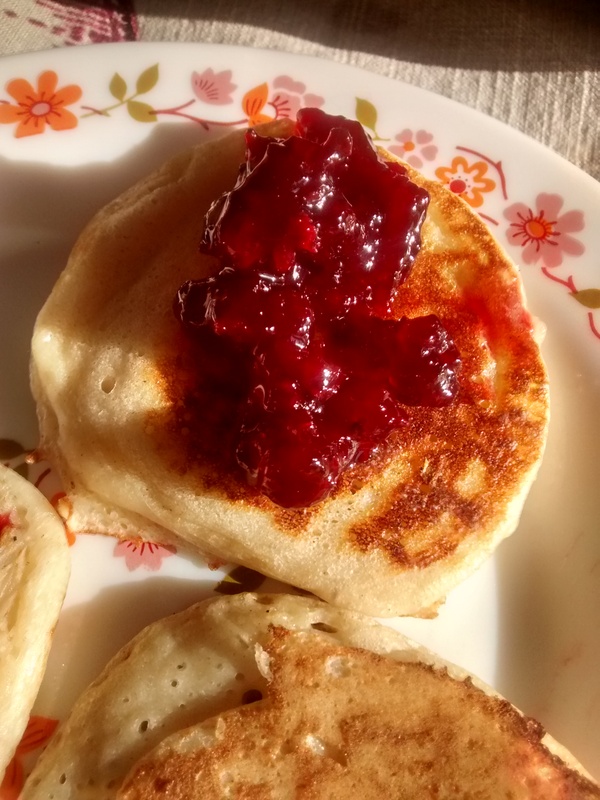 They are small round pancakes like American pancakes or dropped scones and are served with sugar or sweetened soured cream. 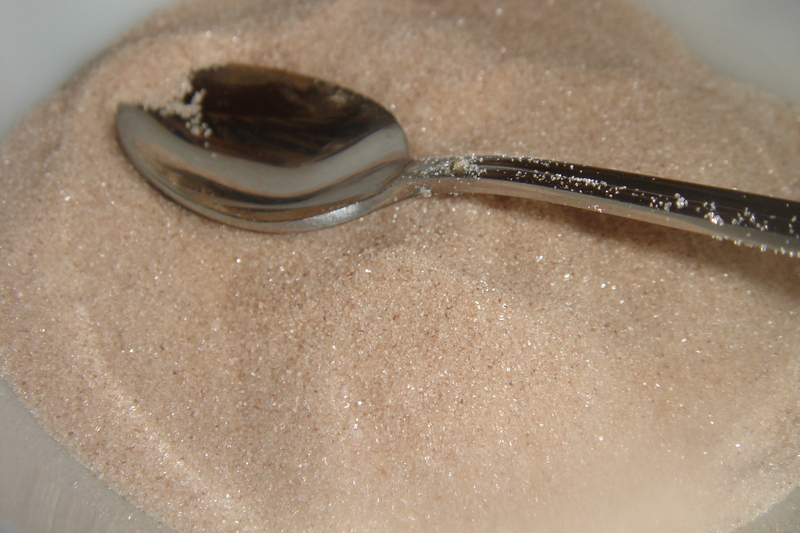 Caster sugar or soured cream sweetened with icing sugar. Whisk the whites until they are stiff. 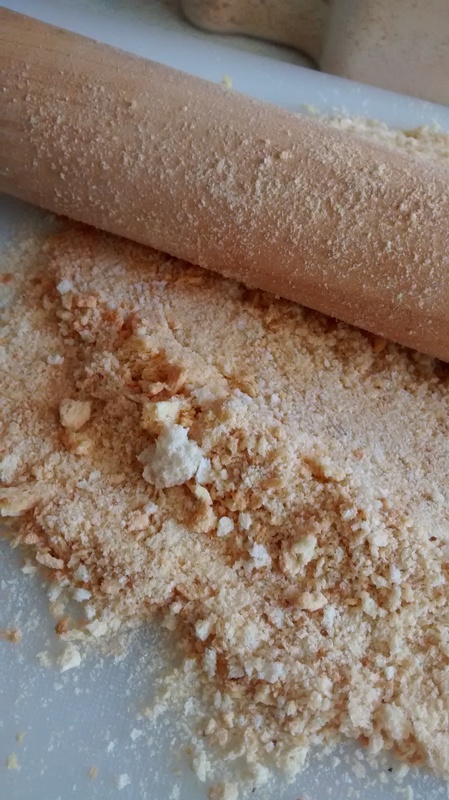 In a small dish mix the baking powder with the flour. 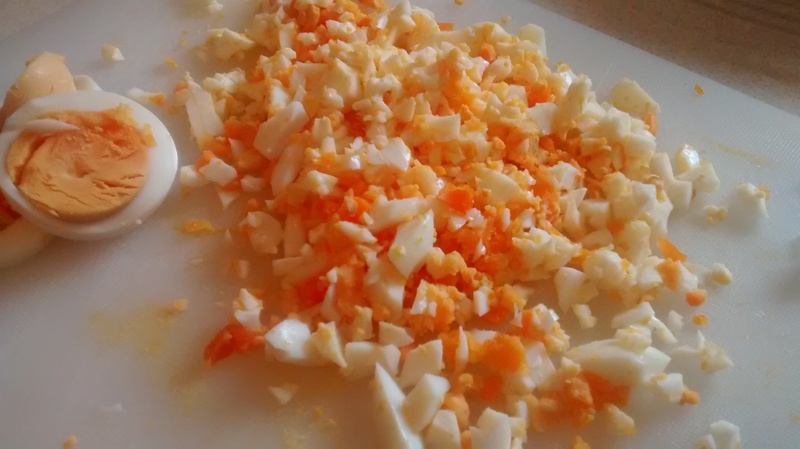 In a large bowl mix together well the finely grated carrots, the cream (or yoghurt) cheese and the egg yolks. Fold in the stiff egg whites. 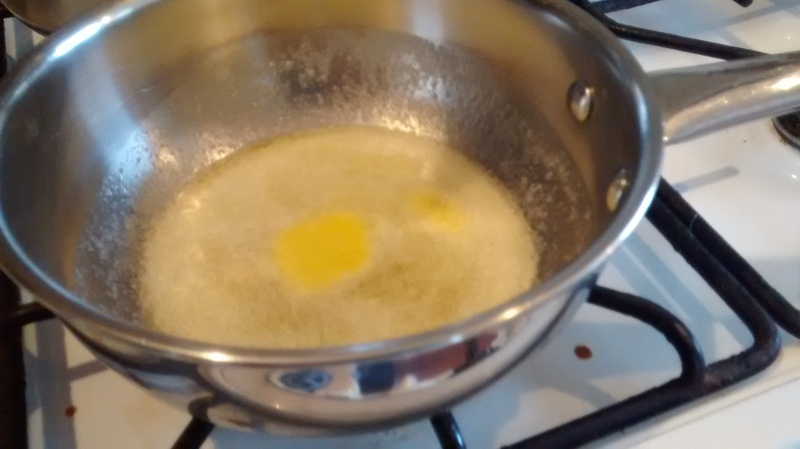 Heat some sunflower oil in a cast iron frying pan or griddle. Use 2 tablespoonfuls of the mixture for each pancake, cook on one side and then turn them over and cook on the other side. Sprinkle with caster sugar or with a dollop of sweetened soured cream. Served here on Wedgwood – Hathaway Rose – 1959 -1987. I have also tried them with maple syrup poured on them & these were also delicious. A racuch – according to my dictionary is a kind of pancake. 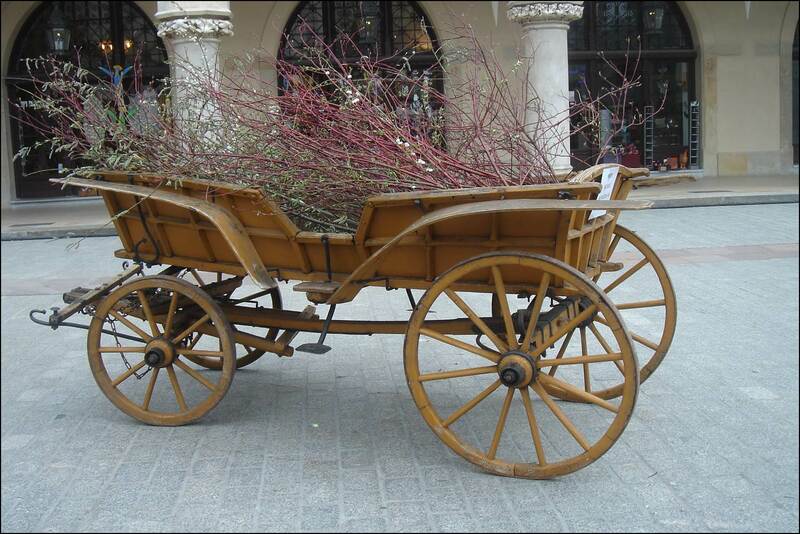 Racuszki or racuchy are plural words for them- used much more as you never have just one! 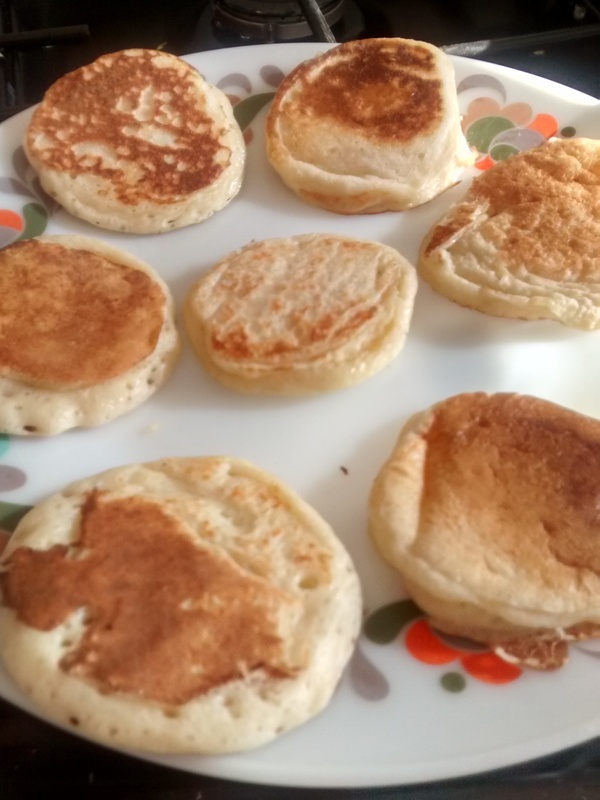 They are small thick pancakes similar to dropped scones, Scotch pancakes or American style pancakes. In my old Polish recipe book, the recipe uses soured milk, but as I do not have this, I use my own thick yoghurt instead. 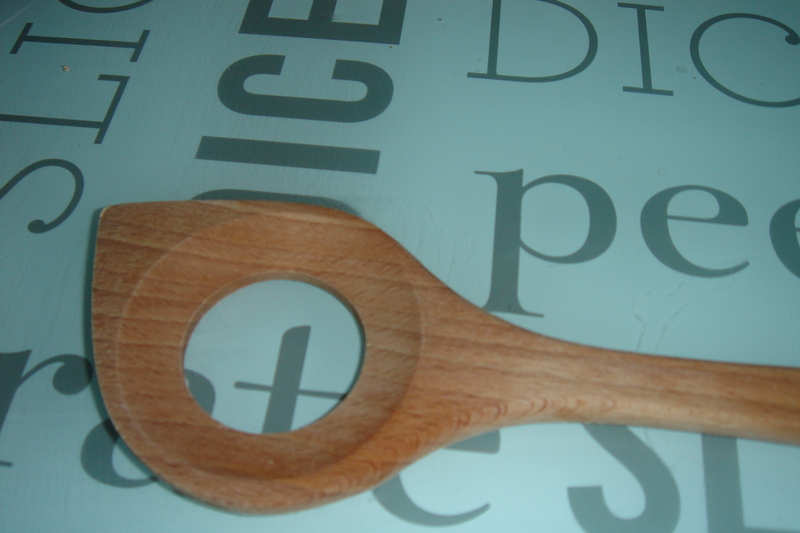 In a large bowl mix the flour, pinch of salt, the egg and some of the yoghurt, mix it with a wooden spoon. I found my new one with a hole in it which I bought in The Netherlands very good for this. 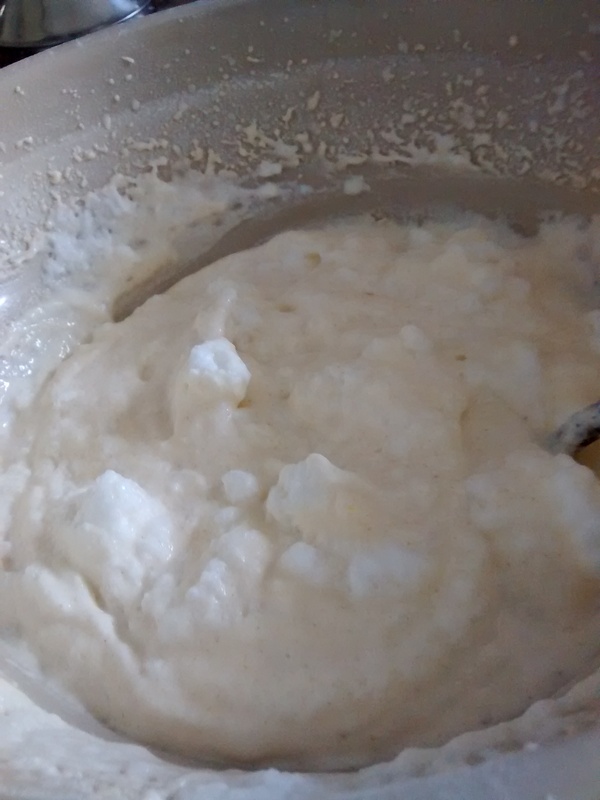 Keep adding the yoghurt (and some water if needed) and mix till you get a batter which is thick and then beat it more till it is smooth and glossy. Then add the bicarbonate of soda and give this a final mix. Use a griddle or thick cast iron frying pan and use oil to grease it lightly and heat it up. 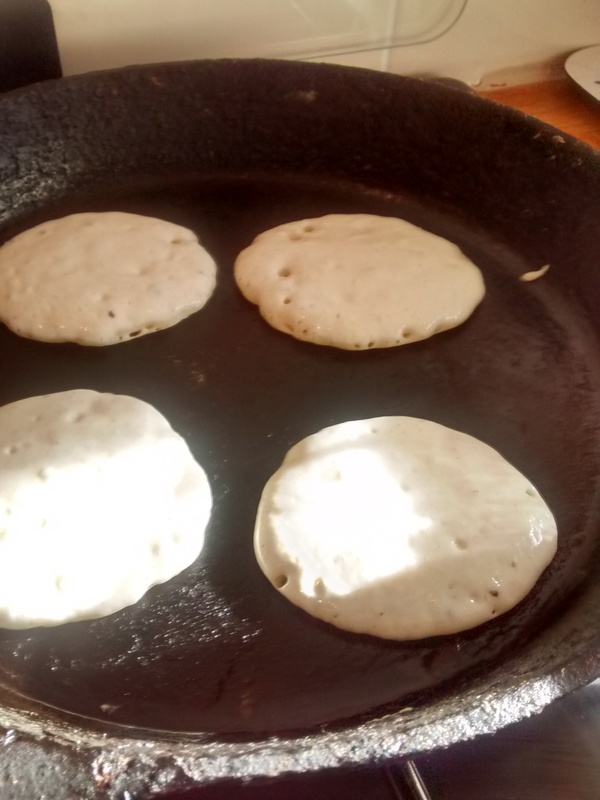 You need to try and keep a low to medium heat so as not to burn the pancakes. Place tablespoonfuls of the batter on the frying pan and cook until the base is set and golden then turn them over and cook the other side. 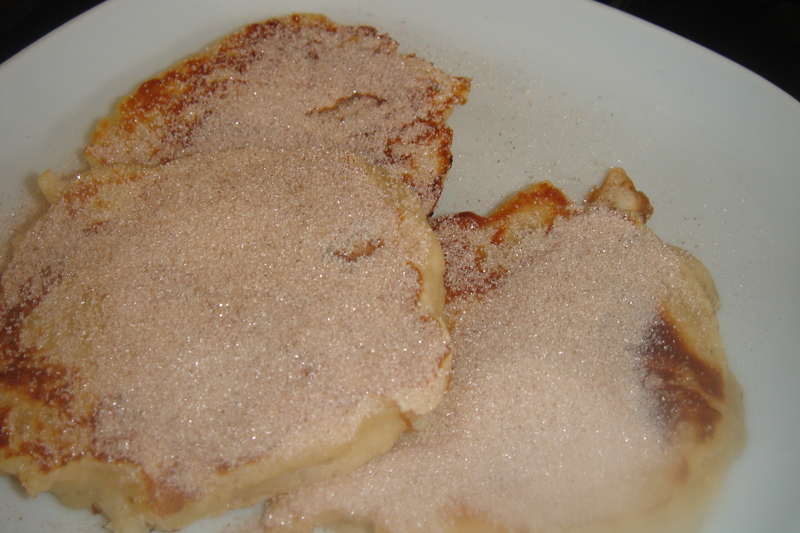 They are traditionally served warm with jam or thick fruit syrup – caster sugar also goes well. 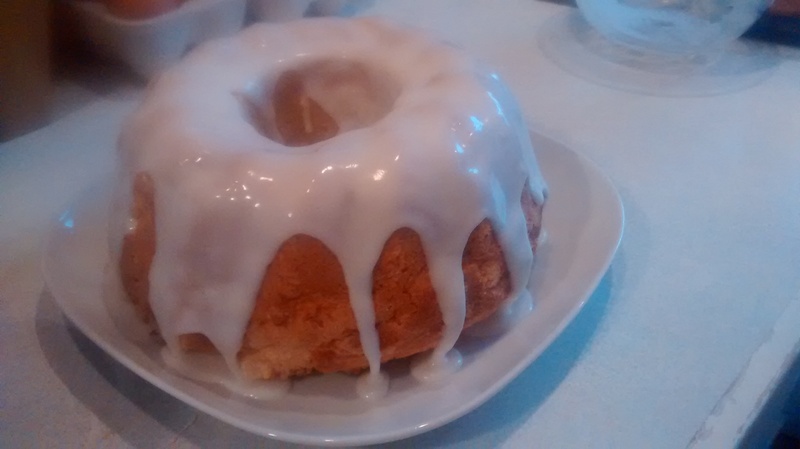 I thought they sounded very much like racuszki, so I jotted the recipe down and when I came home I adapted it slightly by using self raising flour, adding a little vanilla essence and used my own yoghurt cheese instead of qwark. In the original recipe they served them warm with yoghurt & honey, I also tried them with melted butter & sugar, and with maple syrup – from the large bottle I got from my friend who lives in Canada. 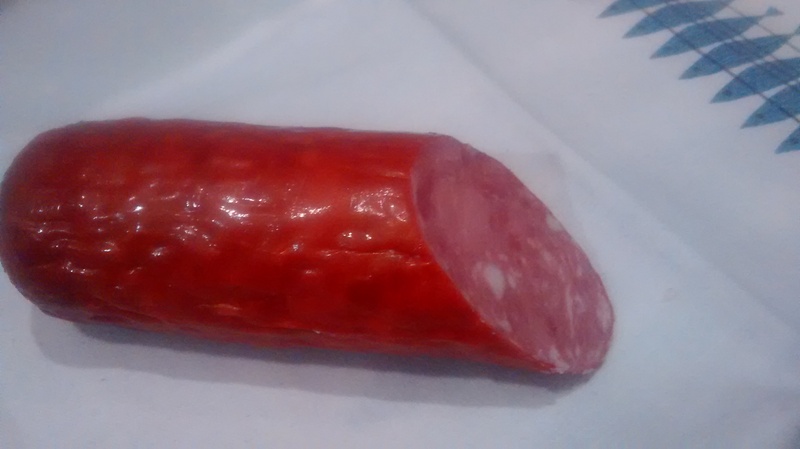 They were super and ones I had left could be easily reheated and were still soft and not rubbery – I will be using this recipe lots from now on. Whisk the egg whites until they are stiff – I tend to do this first so you can use the beaters for the rest of the recipe – without having to wash them to remove the grease. 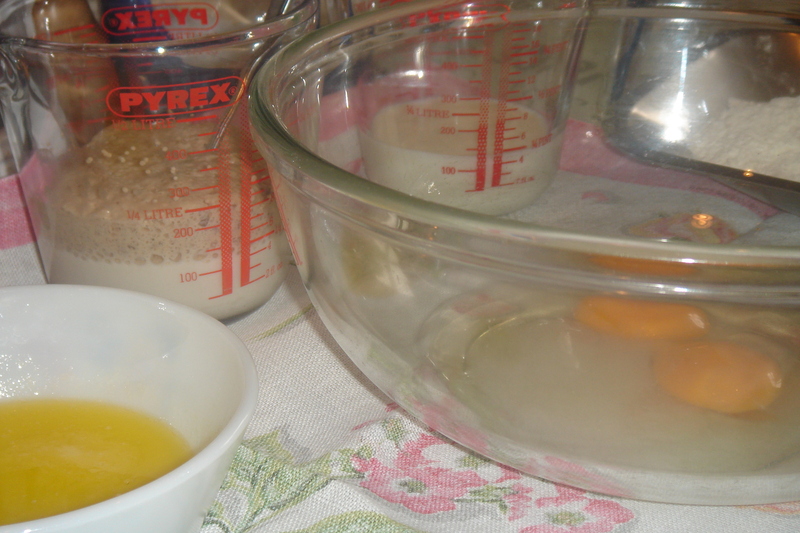 In a large bowl mix the egg yolks, sugar, yoghurt cheese, flour, pinch of salt, vanilla essence and around half the milk. 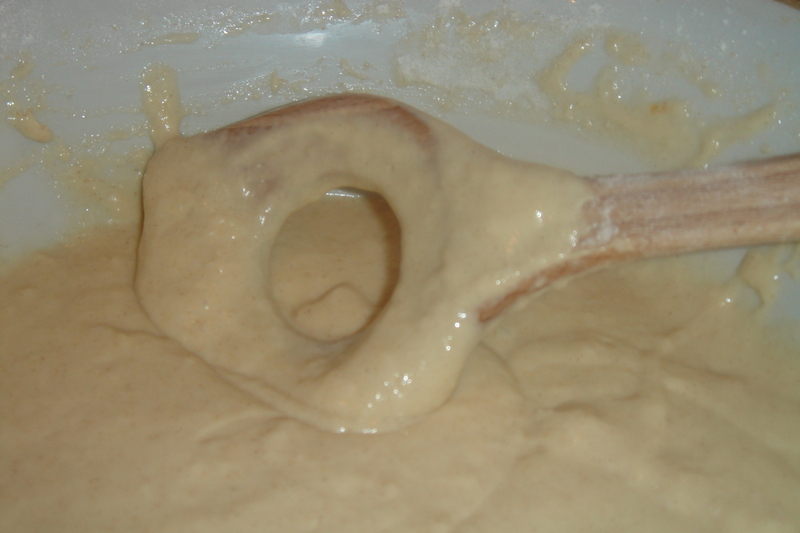 Keep adding more milk and mix well until you have a thick batter – like double cream. With a metal spoon fold in the stiff egg whites. Many years ago I went to stay with my one of mother’s sisters (Apolonia) who lived in the area called mazury – the Masurian Lake District in North East Poland. With apples from the garden she made racuszki – using a thick yeast risen batter and roughly chopped apples – a cross between a pancake and a fritter. They were delicious. 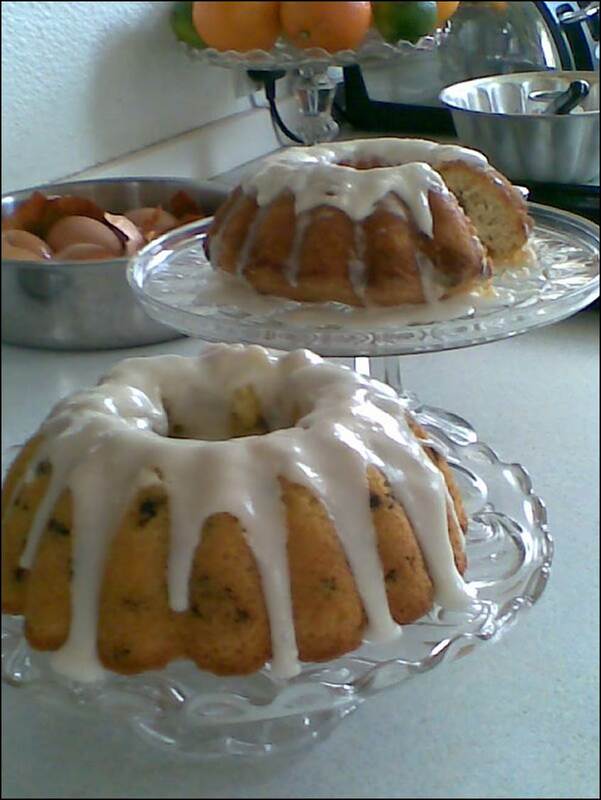 I have made them here many times using her recipe. Whilst researching and checking other variations I saw that several recipes used grated apples – these came out stodgy with little taste of the apple – you need to keep the pieces fairly large. 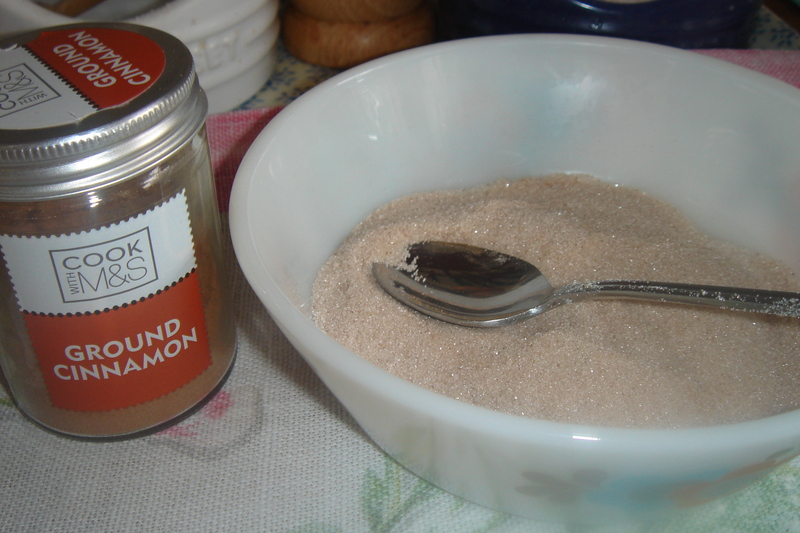 Icing sugar, caster sugar or cinnamon sugar to dust. 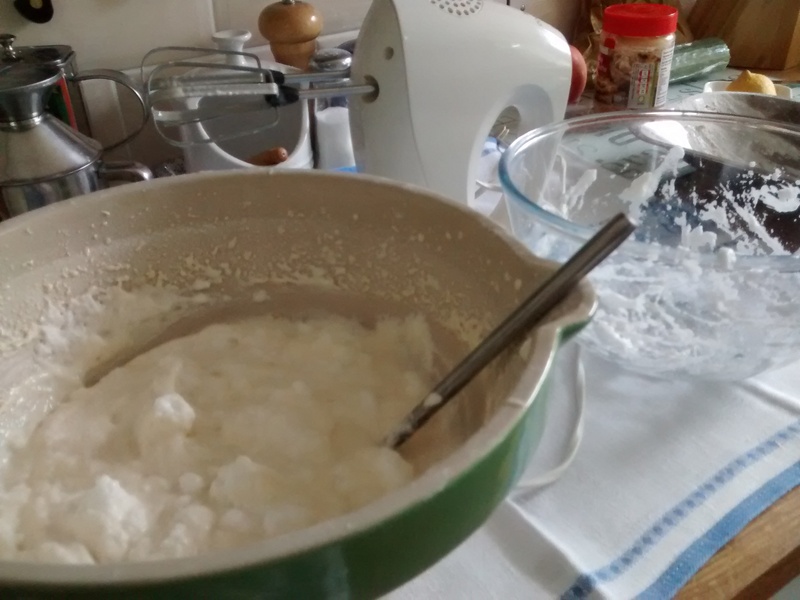 Warm half the milk and add a teaspoon of caster sugar and the yeast and mix it all together and leave it to froth up. Melt the butter and leave it to cool. Whisk the egg with the sugar until it is thick and creamy. Put the flour and salt into a large bowl. 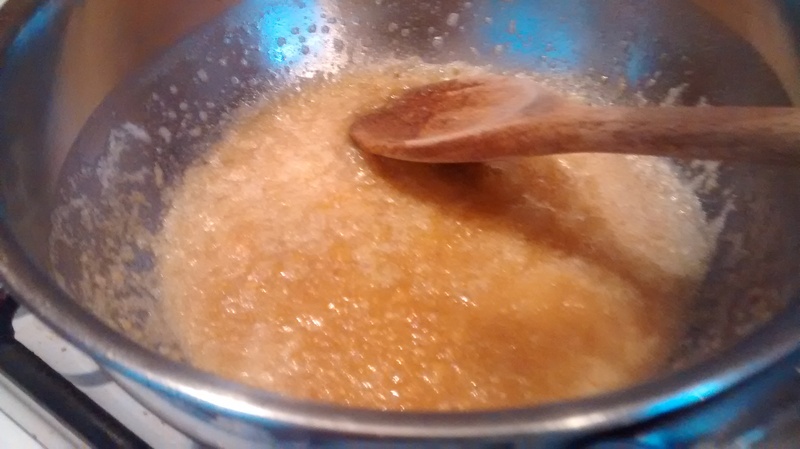 Use a wooden spoon (one with a hole works really well) and beat in the yeast mixture, the egg & sugar mixture and then the melted butter. Slowly add the rest of the milk, mixing until the mixture has the consistency of double cream. 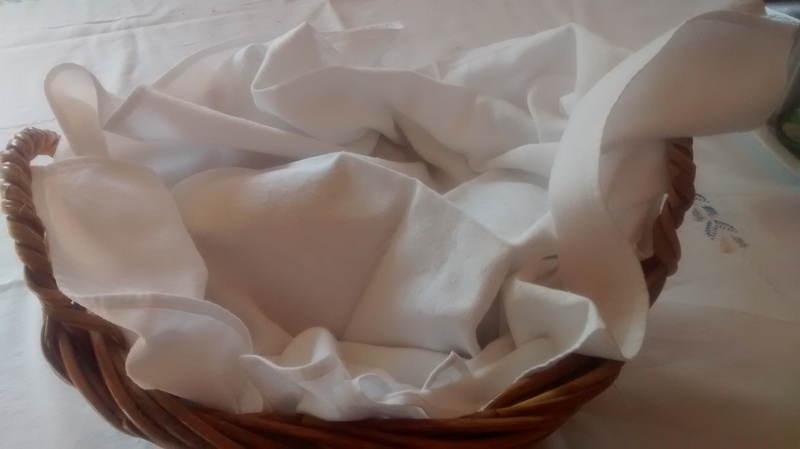 Cover the bowl with a cloth and leave this to rise. 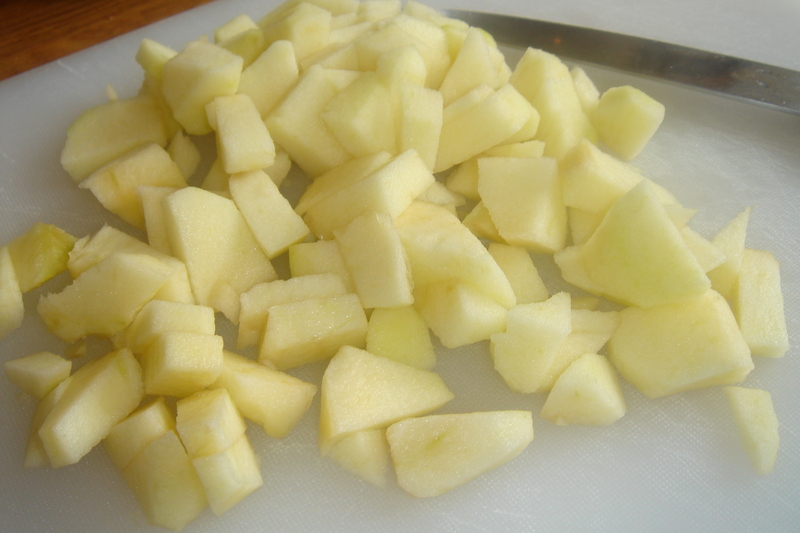 Peel, core and quarter the apples and cut them into small chunks or slices cut in half. 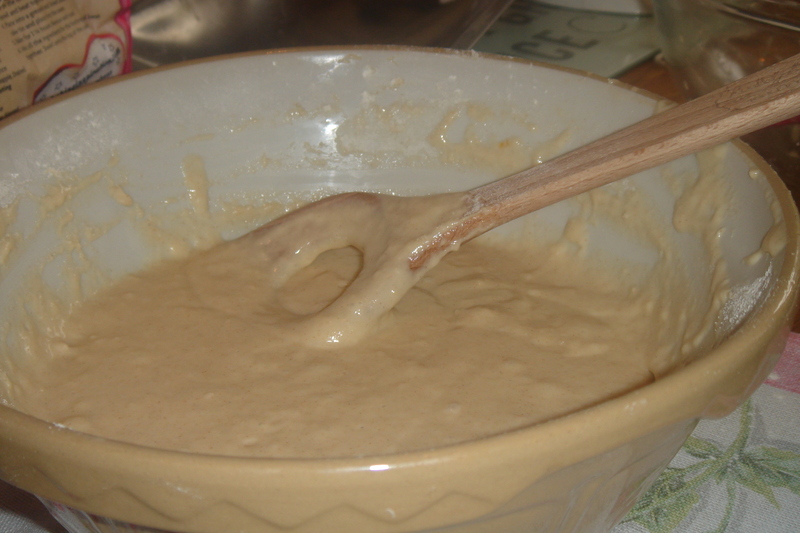 Add the apples to the risen batter and mix them well in to coat them. 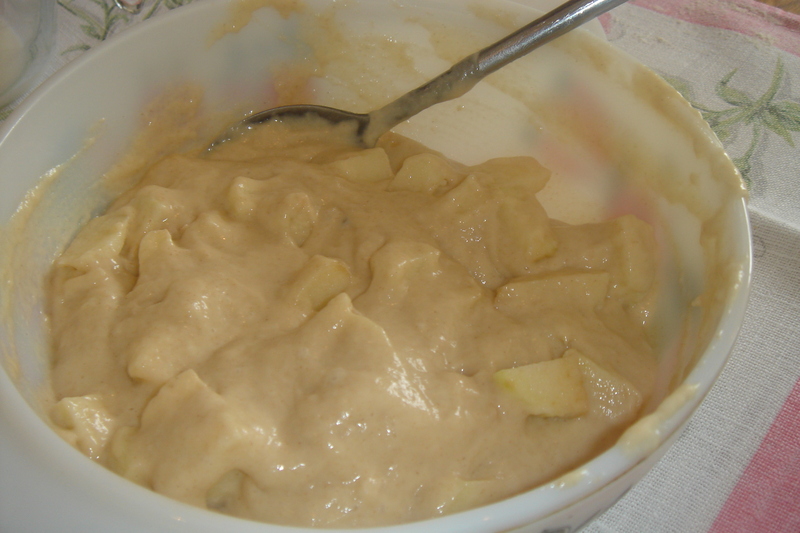 Place large tablespoons of apple and batter onto the pan and cook them so that they are golden brown on both sides. 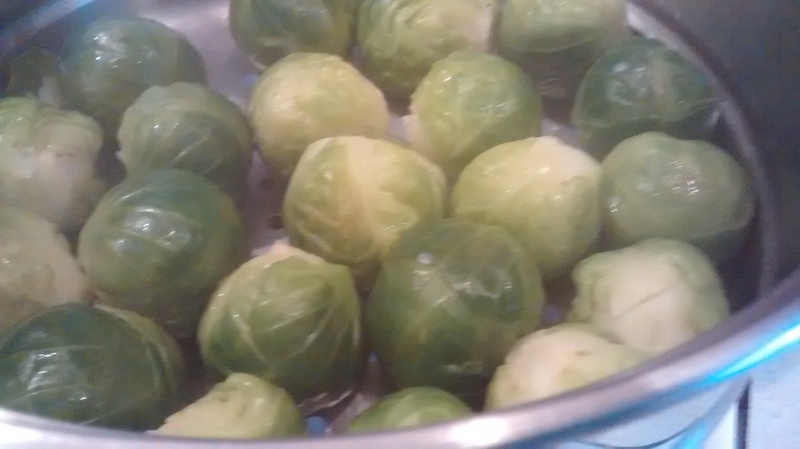 Remove them from the pan and dust them with icing sugar, caster sugar or cinnamon sugar. Easter is celebrated on the first Sunday, after the first full moon, after the spring equinox, which is the 21st of March. So the earliest date for Easter is the 22nd of March and the latest date is the 25th of April. 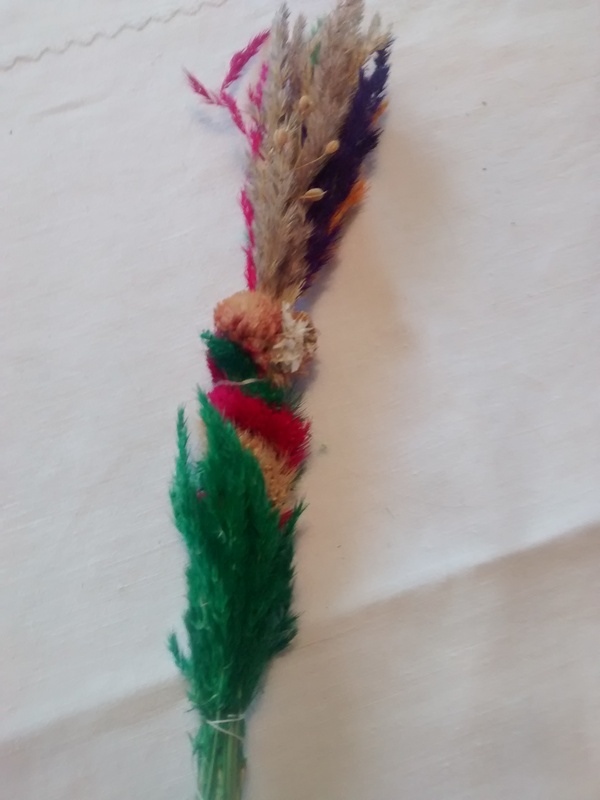 In English the word Easter comes from the name of the pagan goddess of dawn or spring – Eastre or Eostre and her festival was in spring time and hence this old word has stuck. In Polish the name is Wielkanoc – which translates as Great Night – as it is the night of The Resurrection. 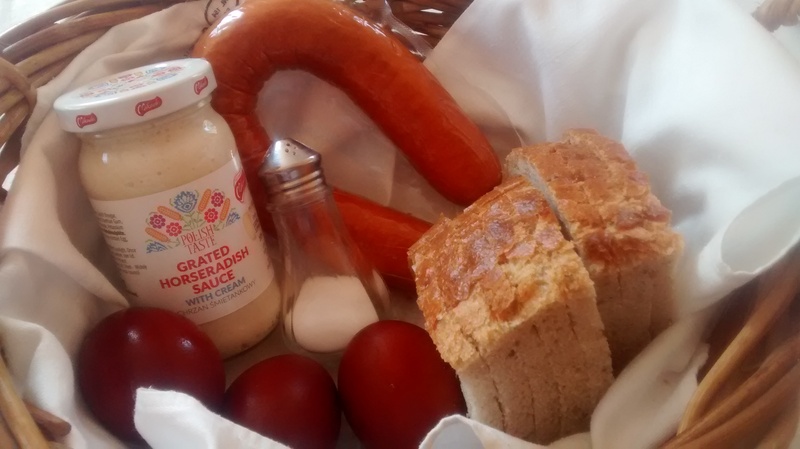 Eggs at Easter were originally a pagan tradition as symbols of fertility, rebirth and the revival of nature and heralded in the start of spring. The tradition was absorbed by Christianity and the egg is now the symbol of the tomb and as the chick hatches from the egg with life so it symbolises the Resurrection of Jesus Christ. 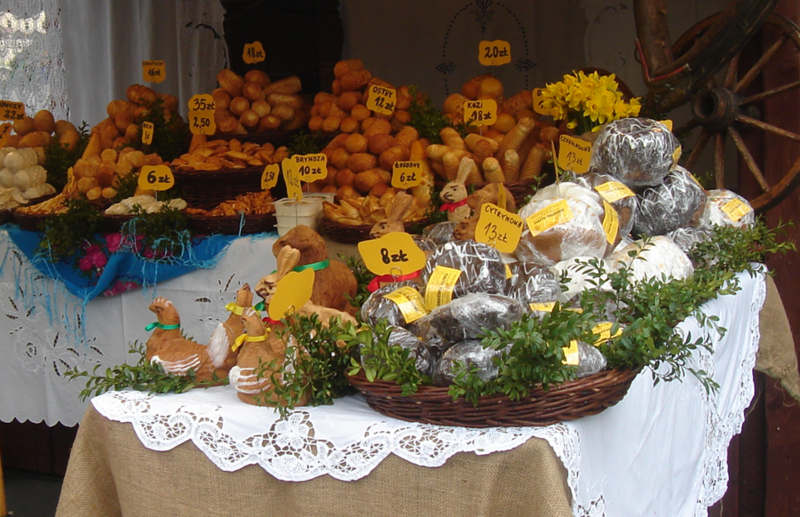 Pisanki are the decorated eggs you find in Poland. The word comes from the Polish verb pisać which nowadays means to write, however in old Polish it also meant to paint. There are many different ways of decorating eggs and each of these has its own specific name – one method uses beeswax and dyes are used to give wax resist patterns – another scratches away the dye to revel the original shell colour. 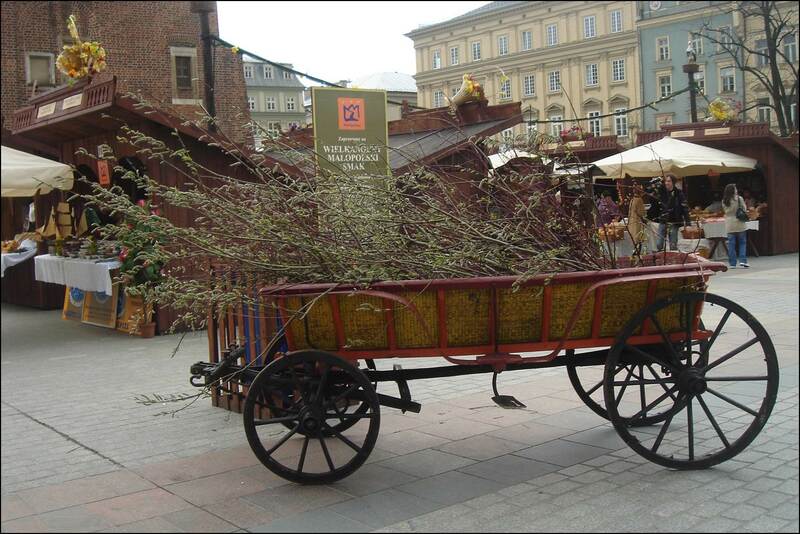 In Kraków there is the Museum of Ethnography, founded in 1902, which has superb displays of intricate and beautiful pisanki through the ages – well worth a visit. Below are photographs of an egg which was decorated using the beeswax and dye method – onion skins in this case. 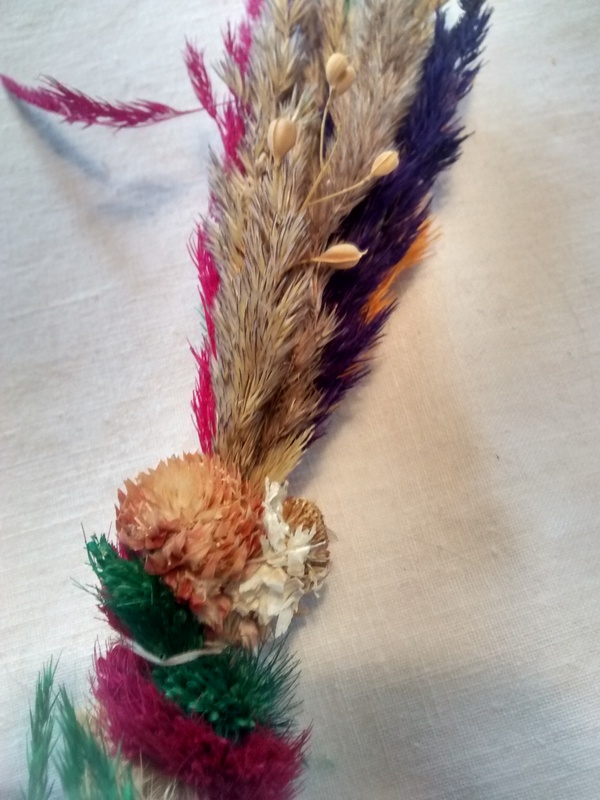 It belongs to the Director of the Leeds Polish Saturday School and was one of many made two years ago with instructions from a visiting tutor at a workshop session for the teachers and pupils at the school. 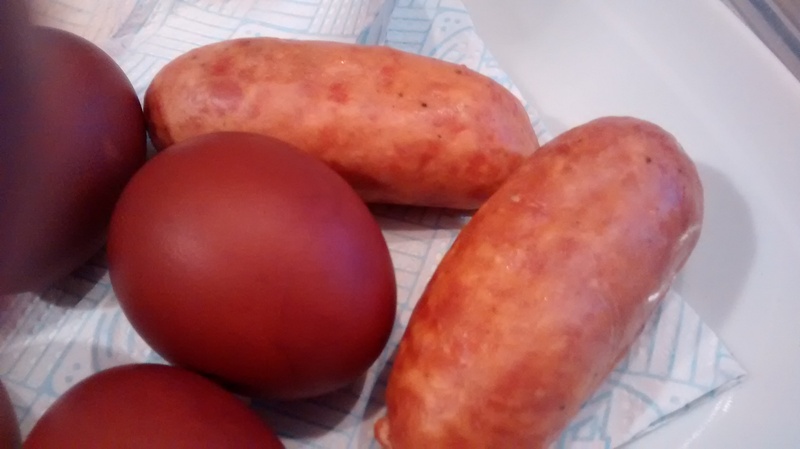 I make very simple coloured eggs by hard boiling eggs with onion skins. Boiling eggs with brown onion skins dyes the egg shells a rich brown colour. Boiling eggs with red onion skins dyes the egg shells a dark red-brown colour. 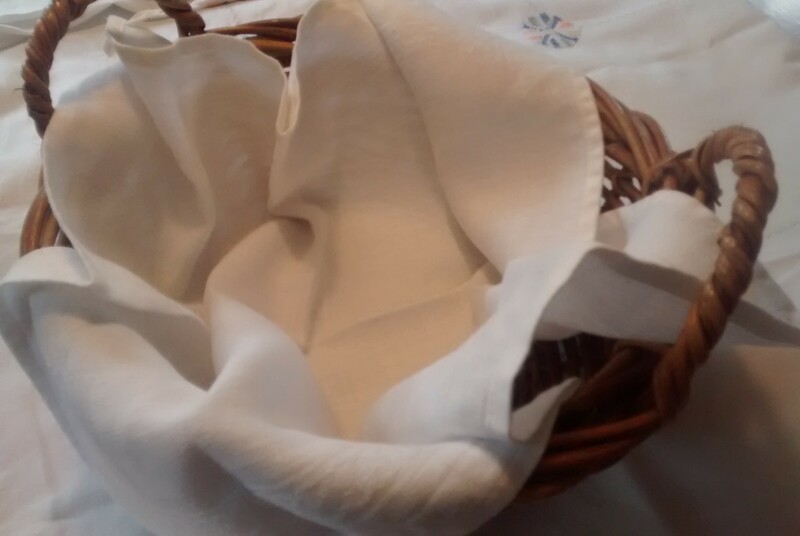 You can buy sheets of coloured paper dyes which give a range of colours – safe edible dyes of course – I have tried these in the past but now just use onions as they are always in my vegetable basket. When hard boiling eggs use eggs that are at least three days old as very fresh eggs are hard to peel. 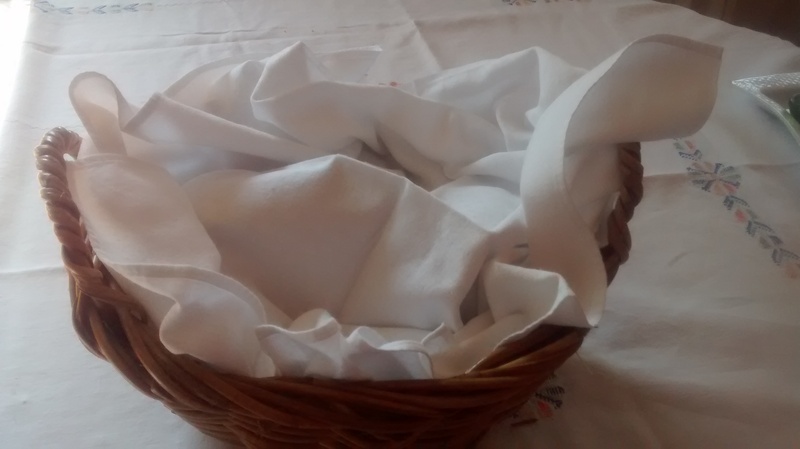 These hard boiled eggs form part of the basket of food which is taken to church on the Saturday before Easter to be blessed see Palm Sunday & Holy Saturday. 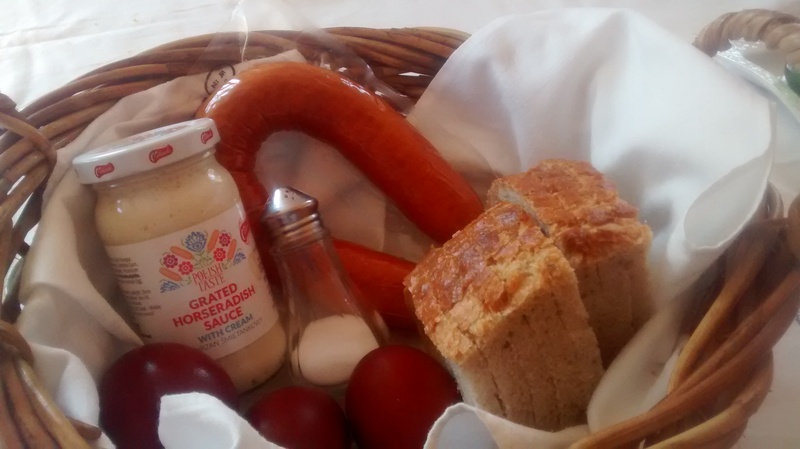 The blessed eggs are peeled and cut into quarters to be shared at the Easter Breakfast with all the people present. Other non- blessed hard boiled eggs are used in a game of tapping eggs together to see which one cracks first. 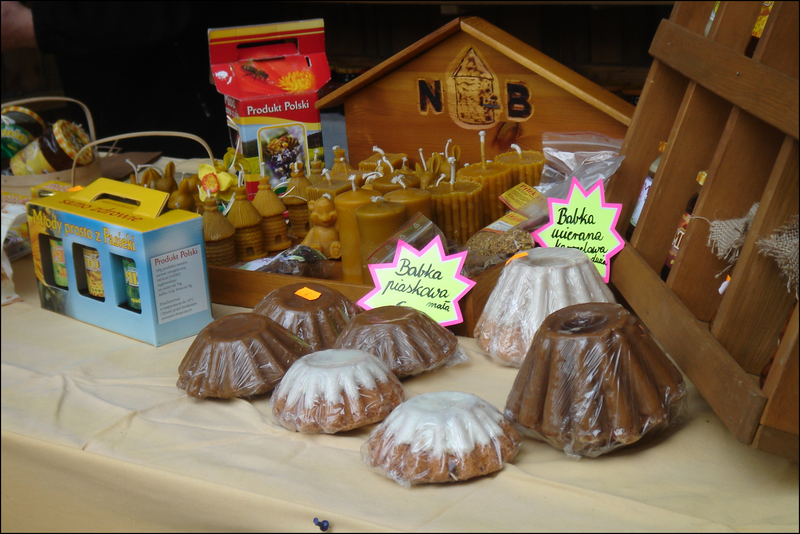 A wooden imitation of these lovely decorated eggs is now a very popular item for sale throughout the year in Poland. 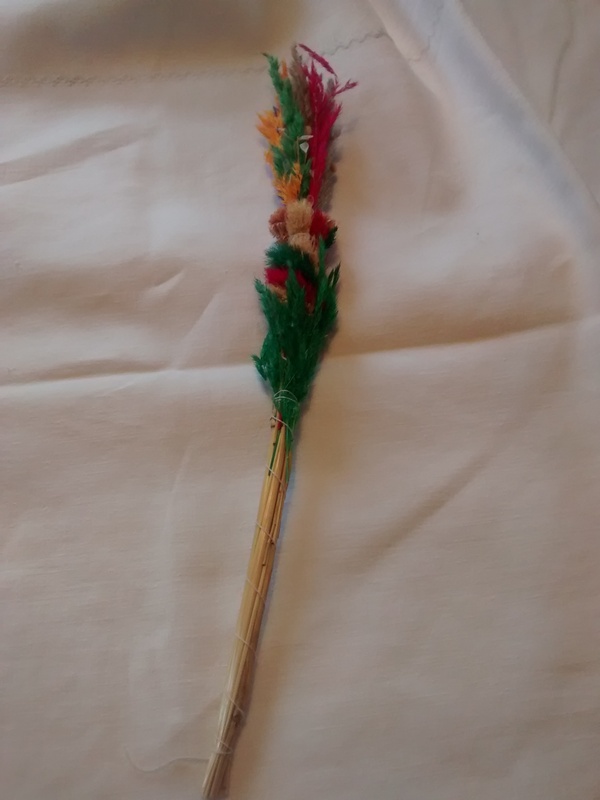 It is a something that many tourists buy to take home. The photographs are taken from recent Easter cards from Poland. May the eggs be delicious. 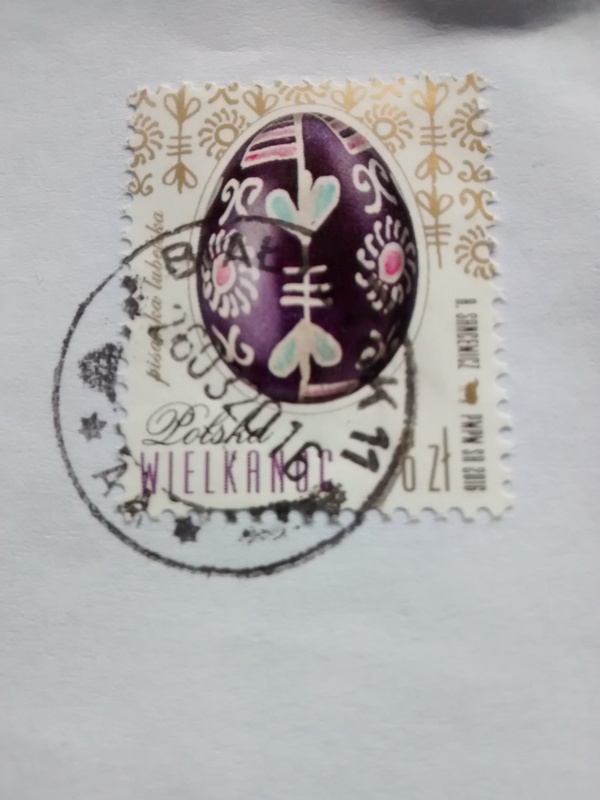 After posting the above I received an Easter card from Poland with the following stamp. 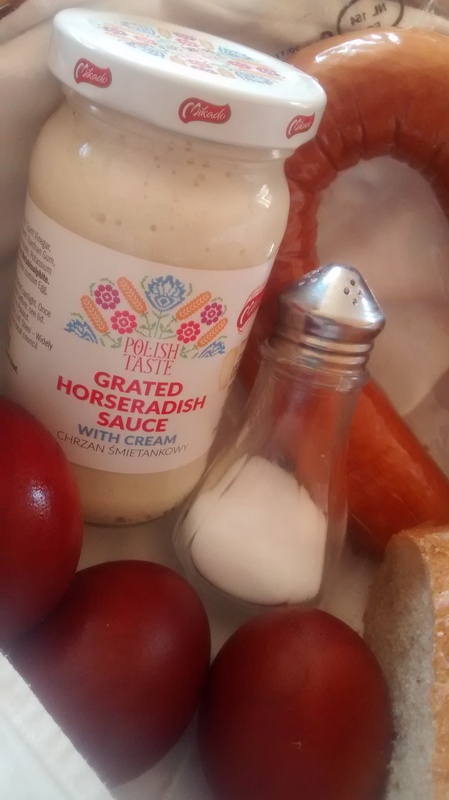 I was well into my 20s before I realised that there was a special French culinary phrase to describe, what to me, was just the regular topping that my mother and aunties put onto certain cooked vegetables. 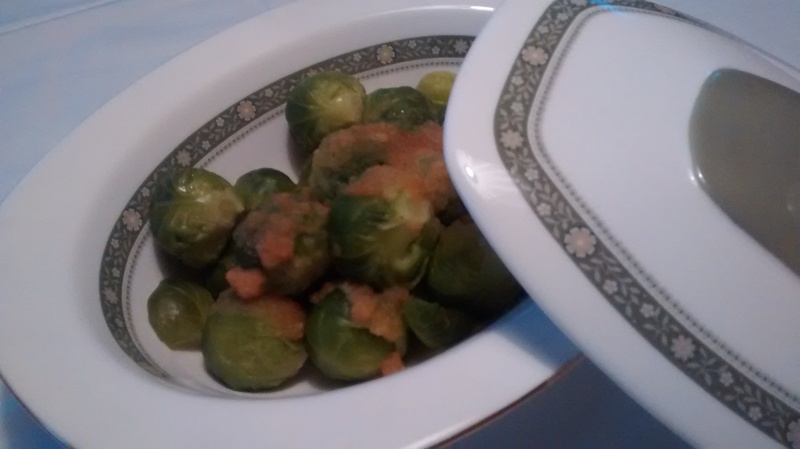 Within my family I had never been served cauliflower, Brussels sprouts or whole green beans without a lovely crispy buttery breadcrumb mixture. I have not discovered when this term was first used in France but some sources think it might have come into use in the early part of the 19th century when many Polish political émigrés came to France and in particular Paris. Cook your cauliflower, Brussels sprouts or whole green bean in whatever way you like best. 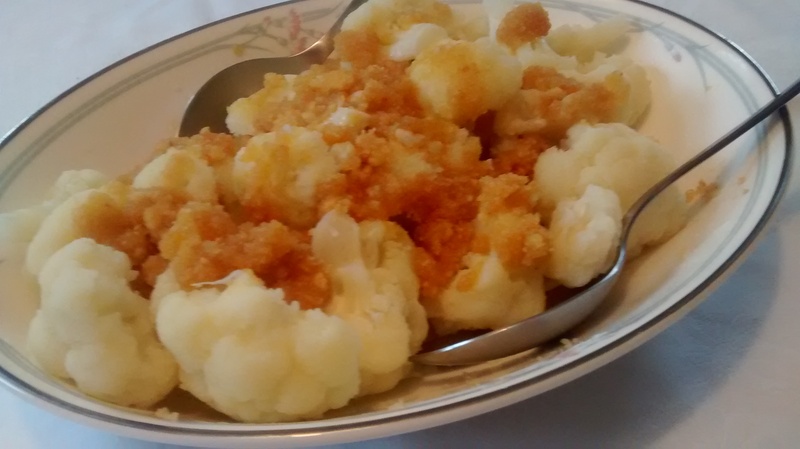 You can if you wish cook the cauliflower whole – this can have quite a good effect when served. 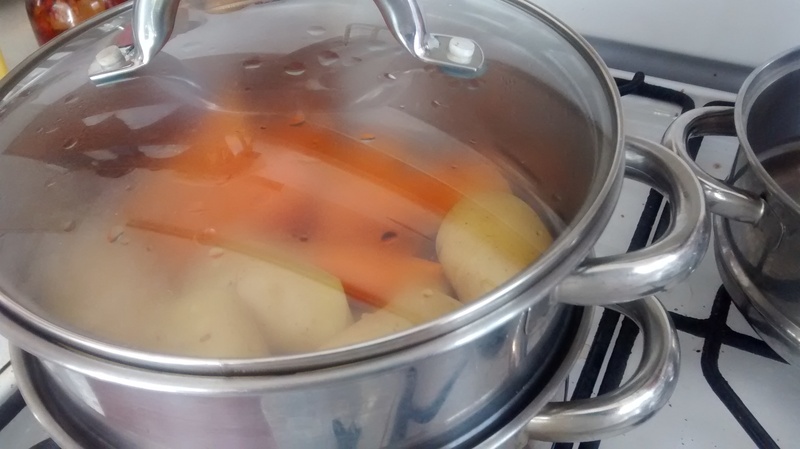 I like to steam the vegetables as I find I can get them just right – cooked – but still with a bit of bite this way. 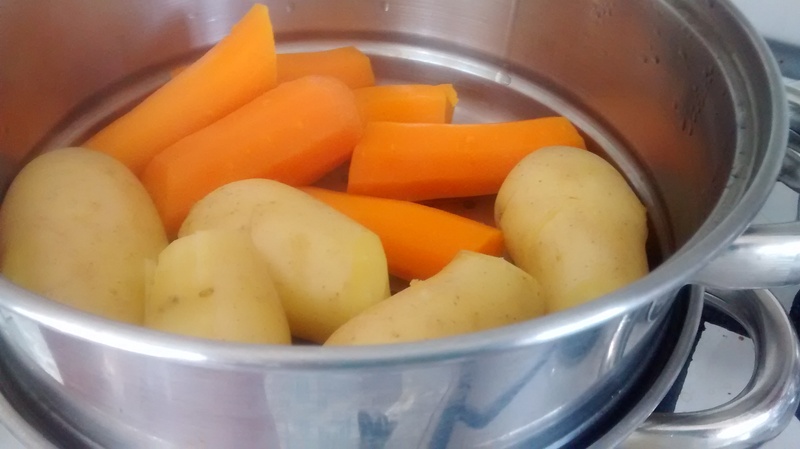 Place the cooked (and drained if necessary) vegetables in a serving dish. Pour the buttery topping over the vegetables. 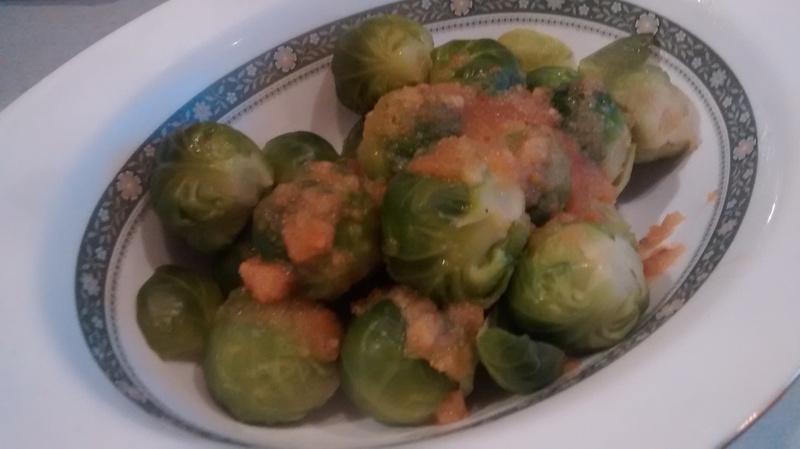 You will get a buttery crunchy taste which is a contrast to the vegetables. 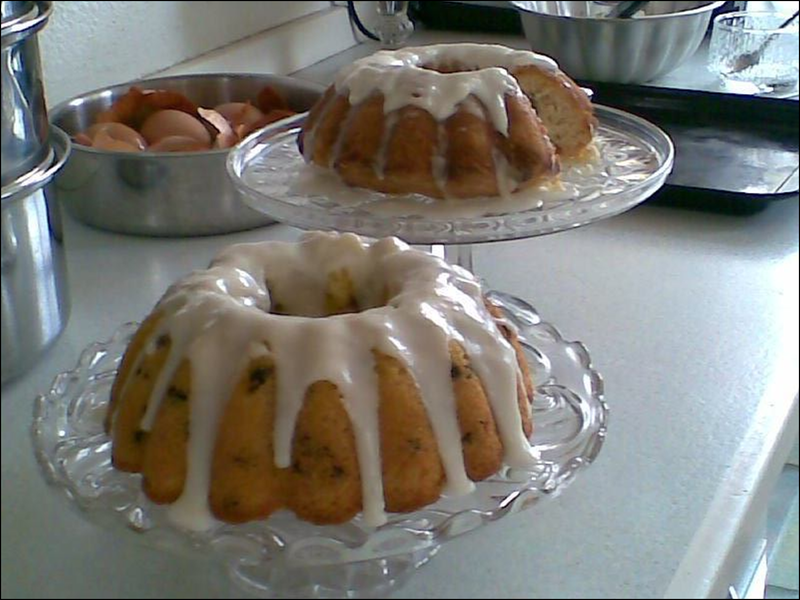 The topping is made by melting in a saucepan 2 to 3 tablespoonfuls of butter. 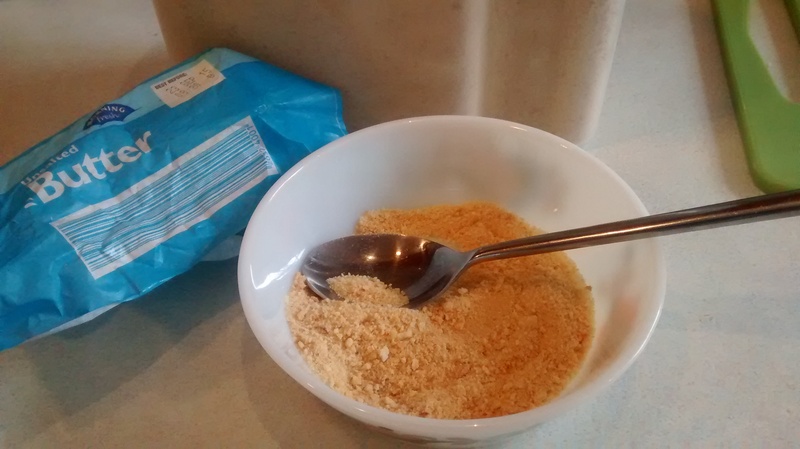 Add to this around 2 tablespoonfuls of dried breadcrumbs and keep on the heat and stir for a few minutes. Pour the buttery mix over the vegetables. 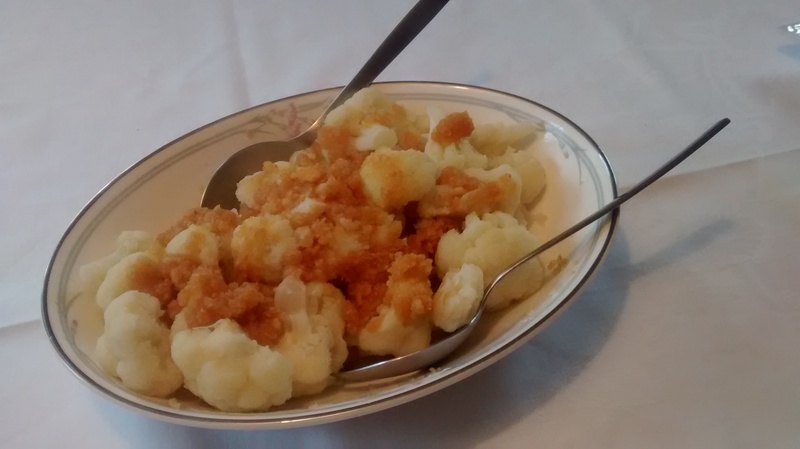 Cauliflower à la Polonaise – served in a Royal Doulton serving dish. The pattern is Carnation produced from 1982 to 1998. 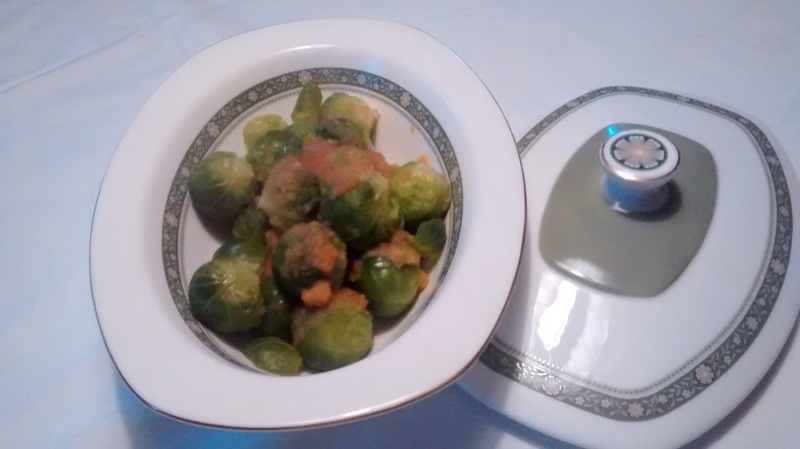 Brussels Sprouts à la Polonaise – served in a Royal Doulton serving dish. 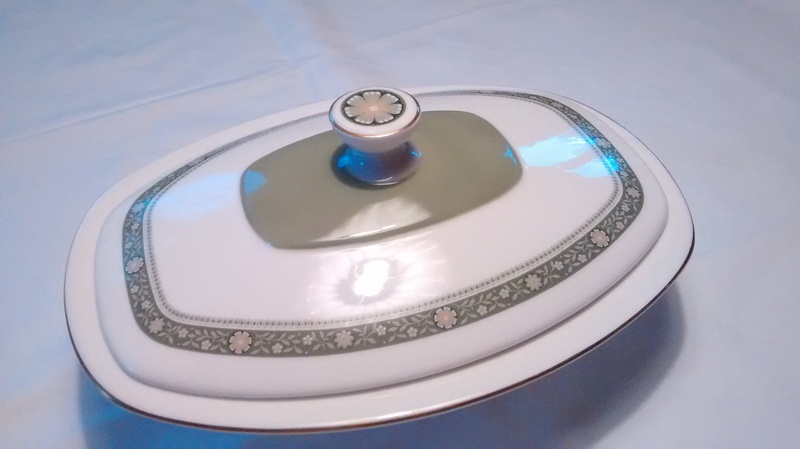 The pattern is Roundelay produced from 1970 to 1997. Some cookery books say that chopped hard boiled eggs and chopped flat leaf parsley are added to the topping. 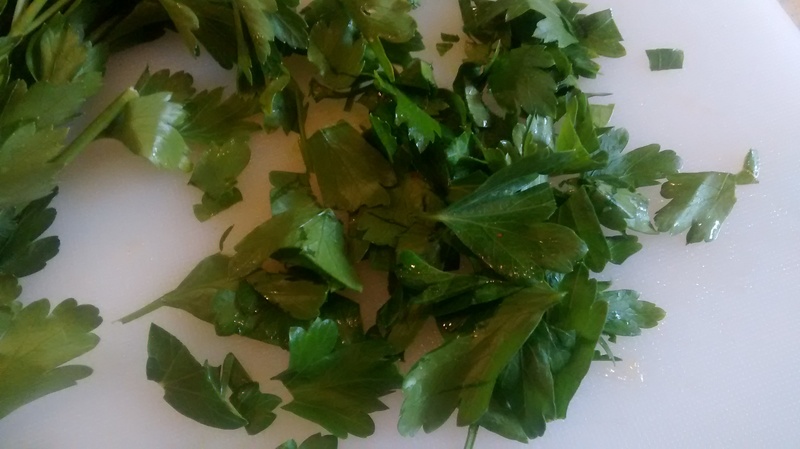 Personally I have not found this to be usually so, although chopped hard boiled eggs are added to many salads and to certain soups in Poland and chopped flat leafed parsley is very often used as a garnish. Before the days of shops that sell fresh and frozen produce all year round from all over the world, this salad could be made in the autumn and winter using bottled or tinned vegetables. This salad is made using mainly cooked chopped vegetables and the aim is to make it colourful and to balance the colours and size of the ingredients. 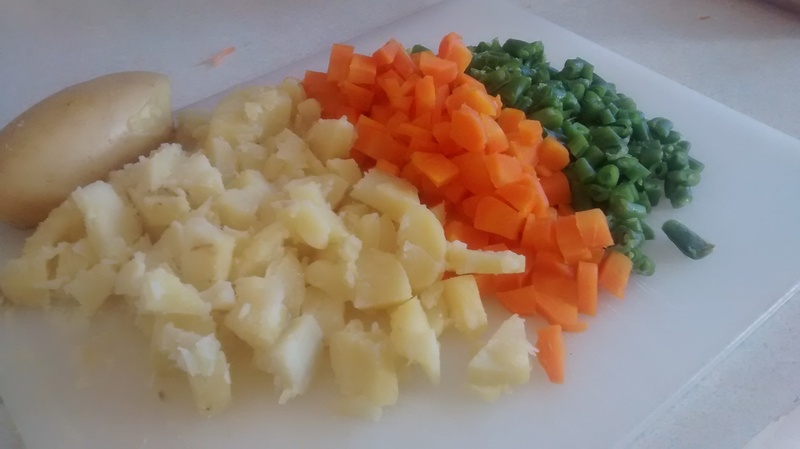 The main three colours are white, green and orange. 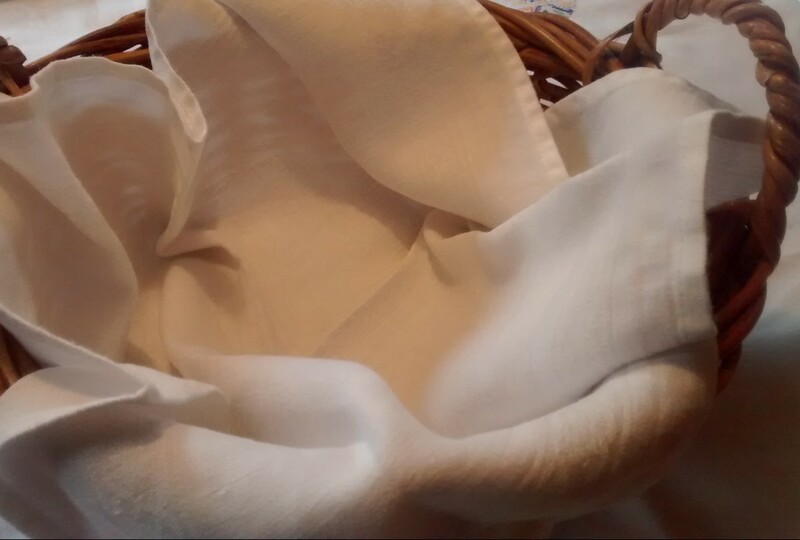 The white is achieved from: potatoes, celeriac or white beans such as haricot or cannellini or even tinned baked beans with the sauce rinsed off. 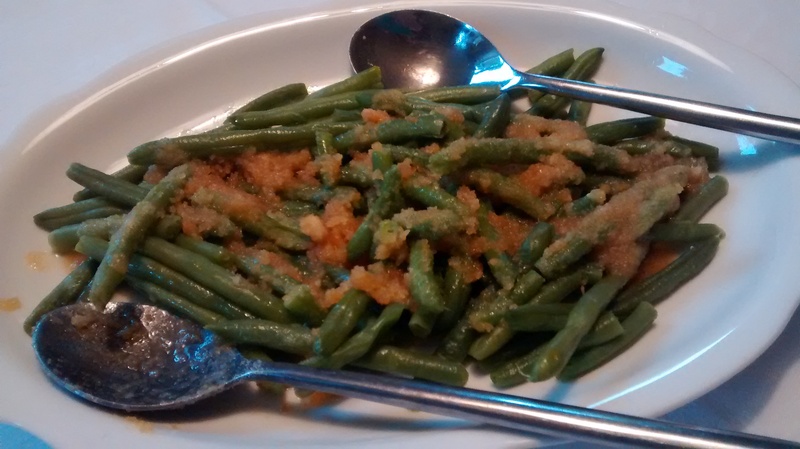 The green is achieved from peas , whole green beans or gherkins. 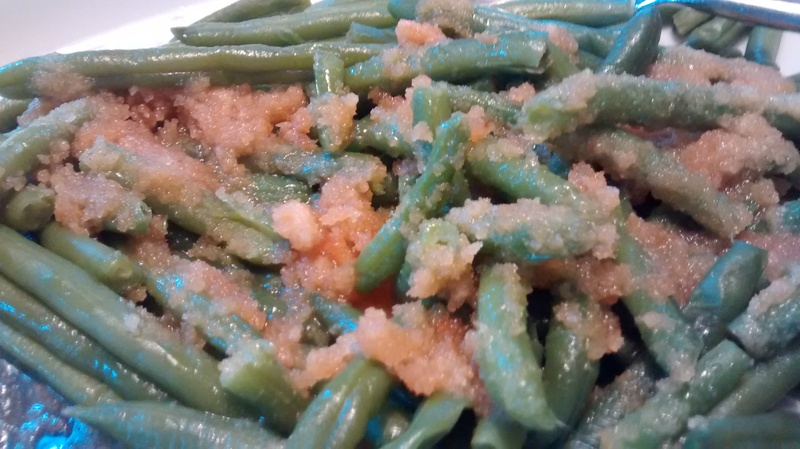 I use frozen peas or whole green beans. The orange is achieved from carrots or bottled paprika. 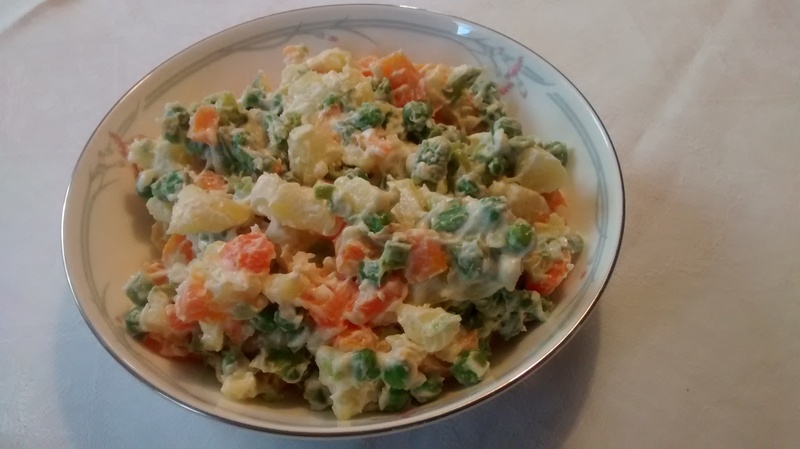 The following salad was made from potatoes, carrots and whole green beans which were cooked before assembling. 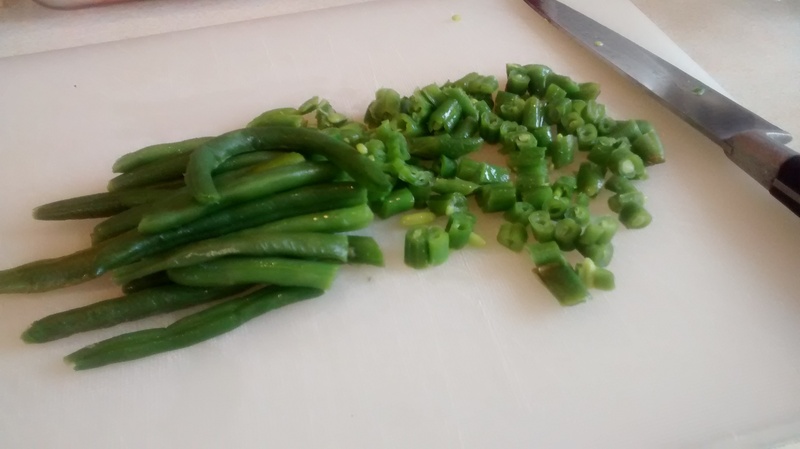 Boil or steam the whole green beans. 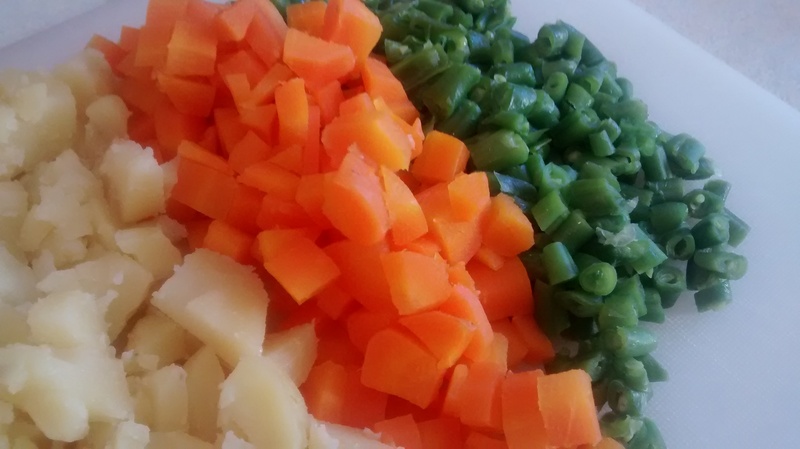 Once the vegetables have cooled then chop them into small pieces. 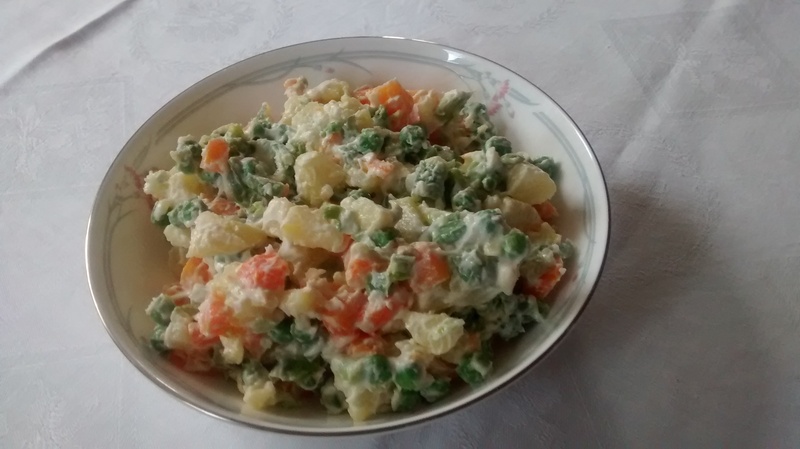 Mix the vegetables together with several tablespoonfuls of mayonnaise – original or light – just enough to lightly coat the vegetables. 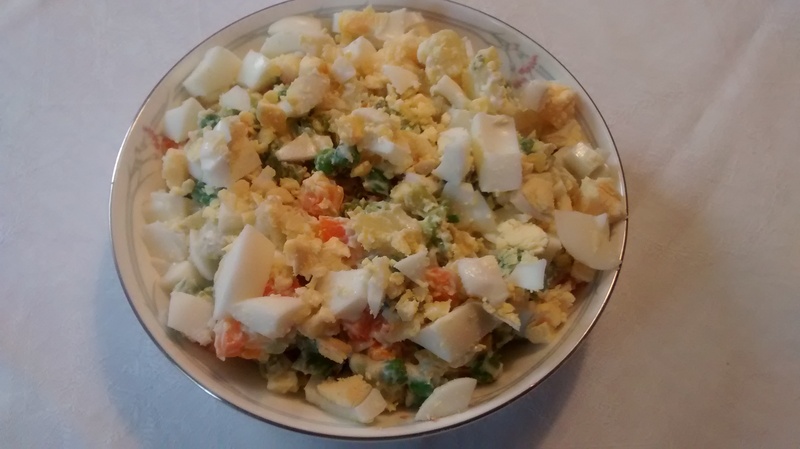 Add 2 hard boiled eggs which have been chopped to the salad. Use Celeriac instead of potato. Peel the celeriac then cut it up into large pieces and steam these – chop the cooked celeriac into smaller pieces when it has cooked and cooled.